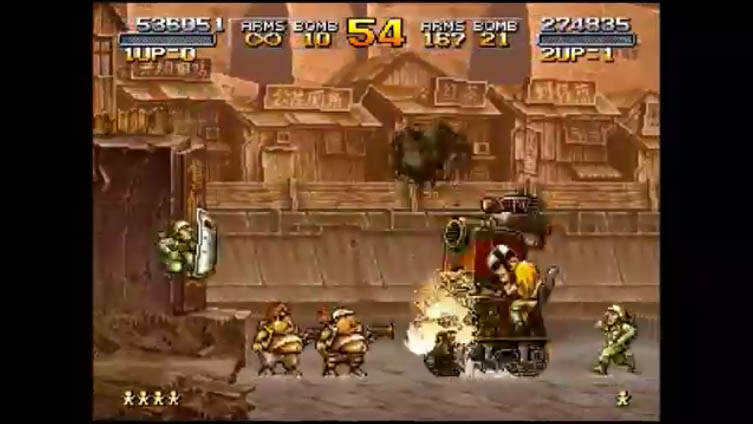 Metal Slug 2 is a 2D arcade shooter. 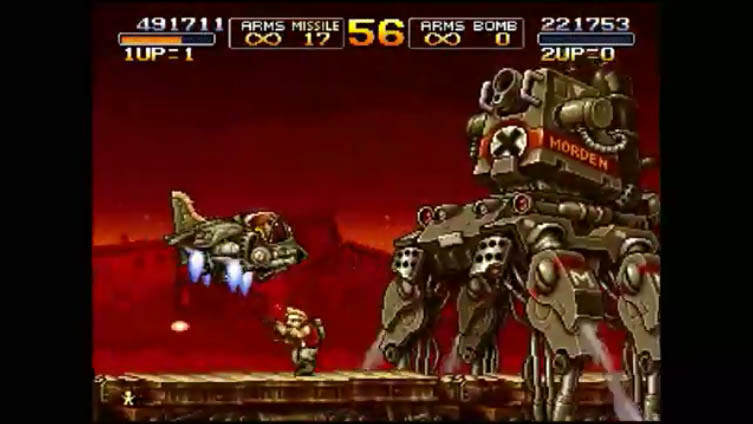 It iss a direct sequel to Metal Slug and it is in the same style as all of the other Metal Slug games but Metal Slug 2 introduces two new characters to play. Special Ops Squad S.P.A.R.R.O.W.S. Sgt. 1st Class Fiolina Germi and Sgt. Eri Kasamoto. You now have four players to choose from and you can play in single player or co-op. It has been two years since Capt. Marco Rossi and Lt. Tarma Roving of Peregrine Falcon Strike Force stopped General Morden and his attempted coup d'état of all of the worlds governments. Small factions of Morden’s army have been around since his defeat and through of as insignificant but lately they seem to be organizing and now the world is worrying about another coup or another war from this latest threat! Metal Slug 2 expands well on what the first game did. It is a classic case of if it’s not broke don’t fix it. You want fun gameplay, got it. You want easy to figure out controls, got it. You want an easy to follow storyline…ok that not really going to happen here but that does not matter. For year many of us did not have any idea what the underlining plot was to the Metal Slug series but we did not care, this is a fun pick up and play arcade shooter. There is also several little humor to the action that just make scratch you head and laugh. For example there are levels were if you get touched by a mummy you become one and for some reason there is food to pick up and eat that will make you a very fat version of yourself. But you do get to find out more about General Morden and his motivations. Metal Slug 2 takes about an hour to play through each time and it has an extremely high replay value. It is easy to just play all the way through. Vehicles are great, the weapon power ups are fun and you never get tired of playing. It is worth paying $5.00 or under for. If your find it under $2.00 it is a MUST BUY PRICE! You can get this game if you can find the Metal Slug Anthology for Nintendo Wii/Wii U compatible, and the PlayStation 2. But if you want to just buy this game then digital copies are your only choice.